Survival originally aired in 1989. Yes, the TARDIS. There are worlds out there where the sky is burning, where the sea’s asleep, and the rivers dream. People made of smoke, and cities made of song. Somewhere there’s danger, somewhere there’s injustice, and somewhere else the tea’s getting cold. Come on, Ace, we’ve got work to do! There was a long gap between Survival and Rose. It was filled with stuff. It was filled with lost of interesting and different Doctor Who stuff. There were books and audio plays and even a television movie to help fill the decade and a half when Doctor Who was not a regular feature of British television. A lot of that stuff was important, and a lot of it helped determine and shape what Doctor Who would become when it did return. It’s telling that the many members of the writing staff on the revived Doctor Who cut their teeth on novels and short stories and audio plays and specials in the wilderness years, while no writers returned from the classic show. At the same time, however, the gap between Survival and Rose doesn’t feel as profound as it might. It’s misleading to suggest that Survival was a clear bridge towards the Russell T. Davies era, or even to hint that the revival could have emerged fully formed from this three-part closing serial. At the same time, Survival is really the closest that the classic series ever came to the spirit of the Davies era, hitting on quite a few familiar themes and ideas and settings, as if Cartmel’s vision of the future of Doctor Who was not too far from the version proposed by Davies. Survival was the end of an era, but it also motioned towards the start of another. The End of Time, Part II originally aired in 2010. The End of Time, Part II is an incredibly confident piece of science-fiction. It’s also fiendishly self-indulgent. “Where are you going?” Wilf asks the Doctor after the Doctor takes a fatal dose of radiation. “To get my reward,” the Doctor responds, as if he has earned enough credit and kudos that he can cash it in for one last victory lap around the cosmos. Cue an exceptionally sentimental sequence in which the Tenth Doctor visits most of his major companions (and a few minor ones) before he departs. It’s a nice excuse to trot out the familiar characters from the Davies era one last time. Martha is there; Jack shows up; even Jackie Tyler gets a look-in. It’s not just the Tenth Doctor’s farewell tour of the universe, it’s a reminder of how skilfully Davies has built a world around his lead character. And this was really the last chance for the show to say goodbye to all of that. It makes a great deal of sense, and it’s well earned. Davies resurrected a television show that died a joke and turned it into a success story that was strong enough to anchor the Christmas and New Year schedules. He’s earned the right to be this self-indulgent. The problem is that the show seems more than a little entitled, more than a little brash about what is owed to it. 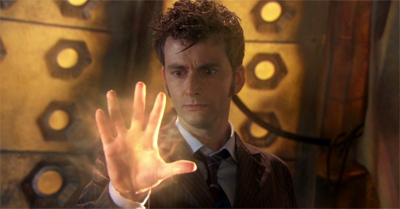 The universe owes the Tenth Doctor one last go around; the audience owes Tennant and Davies enough to put up with this sort of ham-fisted sentimentality. There’s a moment when the Doctor seems to honestly consider leaving Wilf to die from radiation poisoning, and rants against the cruelty of the universe. How dare the universe put him in a position where he has to make this sort of moral choice! The problem is that the episode tries to present this a sympathetic moment. We’re supposed to emphasise with the Doctor as he considers walking away from a poor old man who has been nothing but helpful and trustworthy and friendly to him. 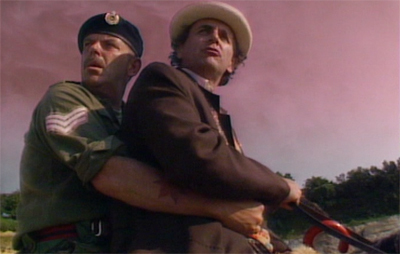 The End of Time, Part II is clearly intended as a celebratory romp in the style of Journey’s End, a reminder of how Doctor Who conquered television. The problem is that The End of Time, Part II overplays its hand a bit, and over-estimates how much the audience loves the Tenth Doctor.